I enjoy book bloggers interview questions, because they really come up with some good ones. Here’s some of my answers from a recent blog site called “Books, Books the Magical Fruit.” The blogger read and reviewed the book Trail of Thread too. Endearing Kansas pioneer women stories. I started writing books in 1992 when my husband was transferred to California for a two-year engineering project. I was homesick for the Midwest and started writing about the Swedish immigrant woman that homesteaded our family farm. Hardest part? Getting started and staying focused. Easiest? I love the research and reading about that time period that my books are set in. Currently I’m working on my fourth book series, the Kansas Quilter, featuring my great grandmother Kizzie (Hamman) Pieratt. Born in 1874, Kizzie grew up in a large family in the Flint Hills of Kansas. She married Ira Pieratt in 1894 and had eight children over a twenty-year span. 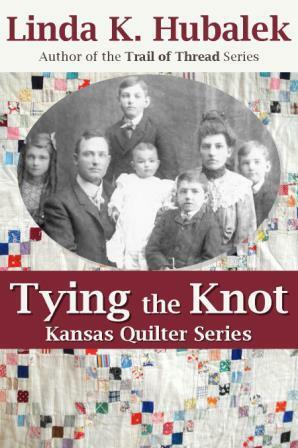 The Pieratt family was featured in my Trail of Thread series, so the Kansas Quilter series will continue their original story into the next generation of characters. Kizzie was known for her quilting. I’m sure at first it was a necessity to keep her brood warm, but she also completed quilts for other people for an income. As I research and write this series I’m taking a closer look at the family quilts that my great grandmother made during her ninety-seven years. I’ll piece together Kizzie’s stories and photos and post them in my blog and in the finished books. Look for the first book, tentatively titled Tying the Knot in the late fall of 2011. All my series have been based on real people, places and the events that went on during their lifetime. It’s a good way to get the research and story started, and it has become my chosen genre. That’s what keeps me pumped up, knowing that someone out there appreciates the research and time put into writing my books. And it means I’ve touched their hearts with my words, and maybe lead them to understand the lives of their own ancestors too. What does your family think of you writing books? Of course my family is proud that I’m a published author, but also proud of the ancestors and farms featured in my series. My parents still live on the original farm portrayed in my first series, Butter in the Well. Because I put township maps in the books (and the roads are still the same) they know when a reader has found their farm. A car slowly drives by to look at the old house and barn featured in the series. Go through my website, www.LindaHubalek.com to find all the links for ebooks and print books. Review for Trail of Thread: I have to say this was a wonderful book – Little House for grown-ups. The letters tell the story of leaving for the unknown prairie and what goes on. I found each letter more enticing than the last to see where the journey would take them. I like that there are quilts that help tell the story also. The patterns are part of what goes on and the materials used are always relevant to the purpose of the quilt.